My dear friend and college roommate Hana is getting married this summer. Hana and Jamaal are going to Italy for their honeymoon, so her sister Mona and I threw her an Italian themed bridal shower. Many thanks also to Jawaad, Mona’s hubby who got roped in to stuff mushrooms, Amna, who made an amazing panzanella and the desserts, and Mahroo for taking the pictures and showing up early to help cook! So, a bit of background. During my senior year of college, I roomed with three of my best friends: Hana-Mona (2 separate people often referred to as one) and Sumreen. Sumreen and I had been roomies since freshman year and we added the H & M duo later. Hana, Sumreen and I were seniors, and Mona, a junior, was (willingly) dragged along on our escapades. My patient roomies served as wonderful guinea pigs that year as I practiced cooking…Ameir and I had just gotten engaged and I thought I should enter married life with more in my repertoire than baking. So, of course, I owed Hana for her patient perseverance :). Many duas and love for Hana as she begins the next chapter in her life. I love you, roomie! Though I make a mean lasagna bolognese (which I’ll certainly tell you about sometime), I wanted to keep this light with a series of salads and hot appetizers. We did a mix of store-bought and super-easy stuff and homemade stuff. I also did as much ahead as possible so that morning, we could just assemble and cook. Even then, it does take several hours so divide up the work and get help on cooking day (thanks Mona, Jawaad, Amna, and Mahroo!). It’s all worth it for a lovely lady like Hana! Here’s the menu: I’ve got some recipes, tips, and techniques after the jump! – Stuffed Mushrooms by Pioneer Woman. Stuffed Mushrooms by Pioneer Woman. These are really my go-to for an appetizer or side dish that everyone will love. – You don’t have to chop the mushroom stems by hand – especially if you’re making several batches, just pulse them in the food processor. – I didn’t have sour cream, so I used labne and it worked just fine. – For something more peppery, sub some of the spinach for chopped flat-leaf parsley. – I made a few of these without panko to keep them gluten free; they were just be a little juicier. A lot of people are gluten free now and I think it’s just considerate to make sure there’s more that they can eat than just a salad. – Do-ahead: The day before, cap the mushrooms and make the filling. You can wash and dry the mushrooms several hours before (or even overnight if you’ll cook the mushrooms in the morning); store in the fridge in an open container lined with paper towels. – Believe me, even people who “don’t like chicken meatballs” will like these (*cough* AMNA *cough*). – I also made one batch without the milk-soaked bread to make them gluten free. – To “Italianize” these a little bit, I added ground parmesan (the green can kind. stop judging), although you really don’t have to. – You really want to do this with fresh ground chicken, not frozen and defrosted – that will be too liquidy and you’ll need to add more dry breadcrumbs or parmesan. – Do-ahead: The day before, make the entire meatball mix – onions, garlic, eggs, spices, etc. everything. put it in a container and line the top with plastic wrap, then put the lid on the container. the next day, add fresh breadcrumbs or cheese if the mixture is too soft to form into meatballs. – Defrost and shell three packs of large frozen shrimp (about 1 pound each). I imagined about 4 shrimp per person (and we had a LOT left over). Ours came deveined and we preferred removing the tail as well, although that’s up to you. – Place the shrimp in a large rimmed baking dish lined with parchment paper, big enough so that the shrimp are more or less in a single layer. You want a rimmed dish so the sauce doesn’t spill out. Drizzle generously with olive oil. – Add LOTS of garlic. Lots. I think I used a whole head. Slice as thinly as possible so the flavor comes through and the actual garlic just melts into the sauce. If you can’t make thin slivers, mince it and mix with olive oil before drizzling. – Chop one or two heads of flat leaf parsley, depending on how much you like parsley. Sprinkle half now, before baking, and save half for afterwards. – Sprinkle with red pepper flakes, salt, and black pepper to taste. – Drop nubs of butter around the dish. – Baking: Bake at 425F for 10-12 minutes. Be really careful here. Overcooked and undercooked shrimp are gross. Start watching through the oven door at around 8 minutes. You’re looking for them to turn opaque and start curling up (but not too tightly). Cut into one shrimp at 9 or 10 minutes if you’re anxious. Remember that they’ll cook for another minute or so after you take them out of the oven. If they’re just a bit underdone when you take them out of the oven, cover with aluminum foil and let them rest for a few minutes instead of putting them back in the oven. – Transfer into serving dish. Sprinkle and toss with fresh parsley and chopped sundried tomatoes. Serve with bread for dipping into the garlic oil. 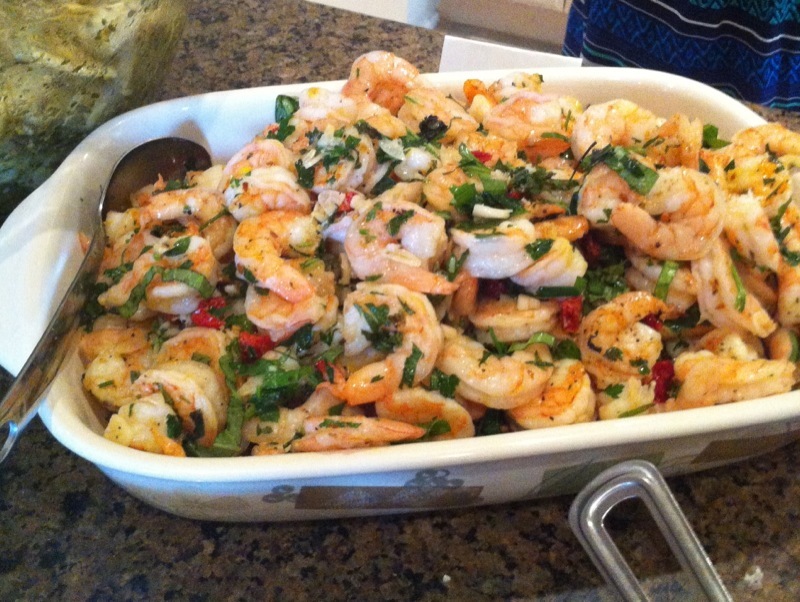 – This one was really my favorite…closely followed by the shrimp scampi. The salad was inspired by this description on Giada de Laurentiis’ website. Since the panzanella already had red onions, I omitted those. Also, I thought light, crispy slivered almonds would be a better than heavy, oily walnuts (also i only had almonds…). 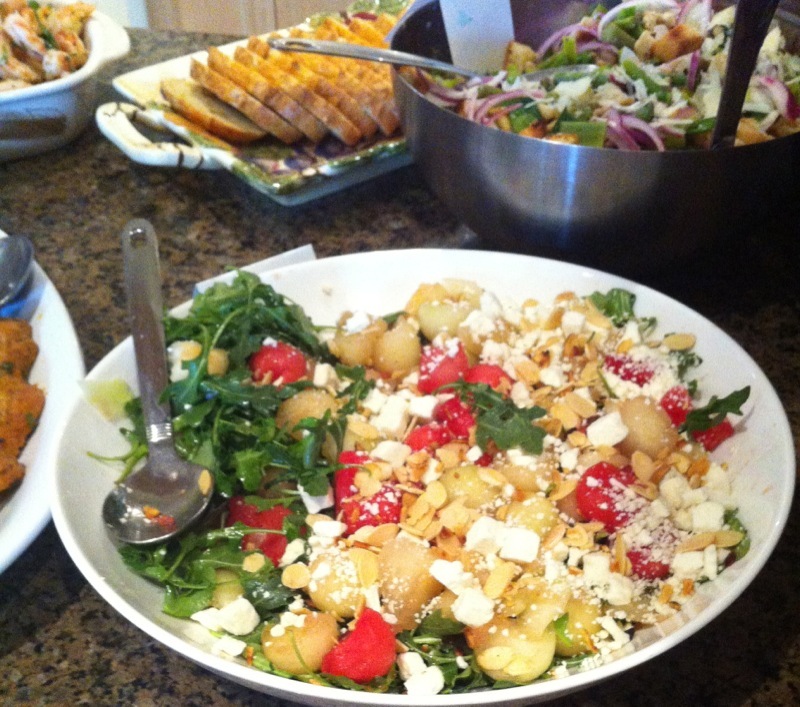 – This is most beautiful as an arranged salad, so make it in batches if you have to. Really think about building layers of flavor, texture, and color here: strong greens + sweet, soft and juicy fruit + salty cheese + and light and crispy nuts. You can add red onions if you really like them, but I assure you that this salad does not need them. – Greens: pick a tart or peppery green like arugala or a mix with different greens in it (e.g. Trader Joe’s Spring Mix) Place these in a bowl and very lightly dress with a balsamic vinaigrette (store bought is great!). Spread this into a wide platter or broad bowl-ish dish (not a deep salad bowl). – Fruit: Use any one or a mix of spring melon you like: watermelon, cantaloupe, honeydew. The week of the shower, Trader Joe’s had these amazing Galia melons I’d never heard of but am now in love with. I chose to make small melon balls because they’re so pretty – you can do this the night before. Lightly dress the fruit with vinaigrette separately from the salad greens, then spread it over the arugala so the greens still show through. – Nuts: Slivered, unsalted almonds were my choice here. Place them in a cold, dry (non-oiled) nonstick pan and toast on medium heat until they get lightly brown. Cool on a paper towel. Sprinkle these gently over the greens and fruit. – Cheese: For the final touch, top the salad with crumbles of a strong cheese – ricotta salata, feta, or gorgonzola would be my choices.